ELFX and ENB can struggle to produce good fps on these areas, and this mod patched those to bring back the performance to normal. + Optimized the Dawnguard Arkngthamz top area near Zephyr bow. This mod is for those having a massive fps drop issue when you use the ELFX mod with the SMIM mod and ENB together. The latest ELFX had optimzed most of troubled areas, but it still struggle with some previous shadow casting light optimization not related to SMIM (colored in green), and those will also boost fps with just ELFX without ENB or SMIM. Folgunthur: Optimized 3 shadow casting lights for 20 to 30% gain. Riften Haelgas Bunkhouse: 10% to 56% boost. See the Recommending mods section. Mzulft 2nd floor(coc mzulft02): 58% boost (38fps to 60fps). Ysgramor’s Tomb: 42% boost (42fps to 60fps) The ELFX blue light on the Flame of the Harbinger. Windhlem CandlehearthHall optimized: 15% to 35% depending on your GPU. Dawnguard Arkngthamz: The top area after the Zephyr bow walking narrow passage before the next open area got optimized to 50 to 60fps. 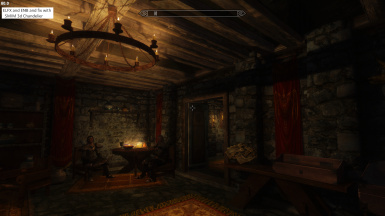 Whiterun Dragonsreach light on/off flicker as you pan your view. ELFX - Dawnguard.esp if you use this mod v1.5.1 option. Do not use this option with this mod's MAIN download. Skyrim Project Optimization mod: With SPO and this mod will boost most out of your game rig setup. Here's the performance statistic in the Riften Haelgas Bunkhouse with GTX 1070 and i7-3770. 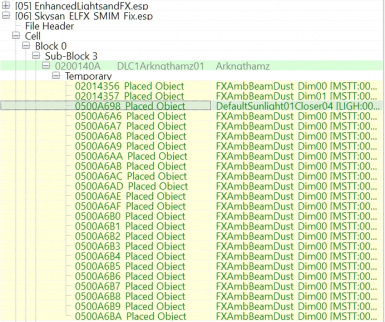 Make sure you activate this mod's Skysan_ELFX_SMIM_Fix.esp after the ELFX vanilla mod. 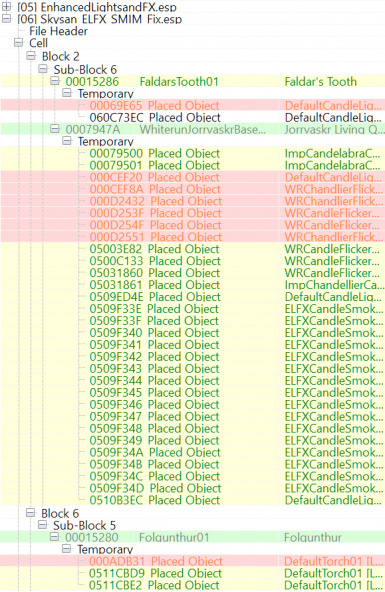 If ELFX is missing or not active, Skyrim will CTD if Skysan_ELFX_SMIM_Fix.esp is active. If you have merged ELFX mod and options, you may need to merge this mod to that merged mod. For v1.5.1 and older, please make sure the EnhancedLIghtsandFX.esp and ELFX - Dawngard are activated before this mod. Not recommending this, but I was able to merge ELFX v2.0 and this mod v1.4.1, but It literally merged (created clones) on Ustengrav and Folgunthur. This mod's v1.2 edits were merged correctly. Here's how I merged. Used the fresh copy of ELFX v2.0 "CORE" EnhancedLightsandFX.esp file and this mod’s latest v1.4.1. Followed the Merge Plugins xEdit Script mod's "Merging Plugins:" tutorial, and took 6 minutes to complete on my PC. When exiting xEdit, I only selected the new merged ESP file to update only that file. I don't know why it selected ELFX and this mod ESP file in addition. This mod uses the ELFX mod as a "master" file, so this mod won't conflict with the ELFX mod. 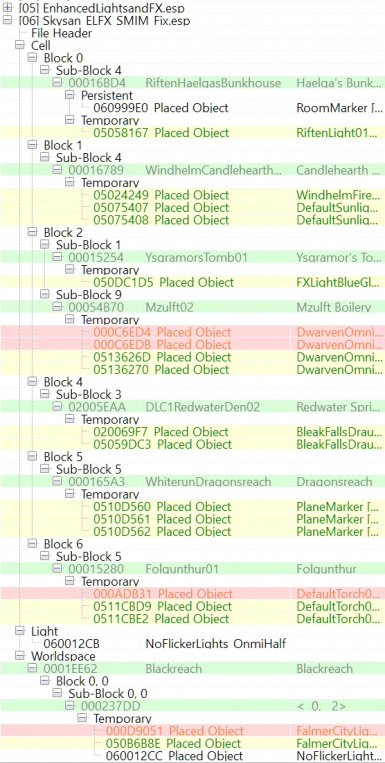 Here's STEP wiki guide on merging mods without conflicts vs TES5Edit Merge Patch for conflicting mods. The shadow calculation is done through CPU in the Skyrim engine, and the ENB adds more calculation for the realistic and better shadow casting. 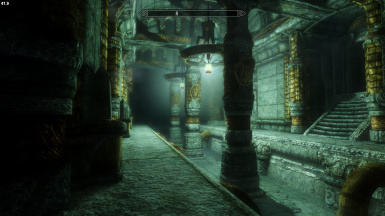 ELFX's goal is the maximization in visual, so it pushes the Skyrim engine limit. Some ELFX shadow lights have the "No Fade" setting, and the shadow calculation will ignore the room boundary optimization. While still keeping the ELFX visual quality as closely as possible, this mod optimized those lights to that boundary if Bethesda had one included (i.e. mzulft02), and limit the "No Fade" setting usage when not required (i.e. Dawnguard Redwater Den Spring).